What a great way to Celebrate EARTH DAY!!! Friday, April 22, 2016. It is a special day that started in 1990 – brought awareness of pesticides used in our crops and focusing on a cleaner environment. Organic foods began its slow resurgence at this time. A friend of mine eats 1/2 of an avocado every day. Mainly because she likes the creamy texture and taste. Instead of a salad or other ways to eat your avocado, how about dessert? This creamy high protein fruit goes well with cocoa in a smooth and luscious dessert. 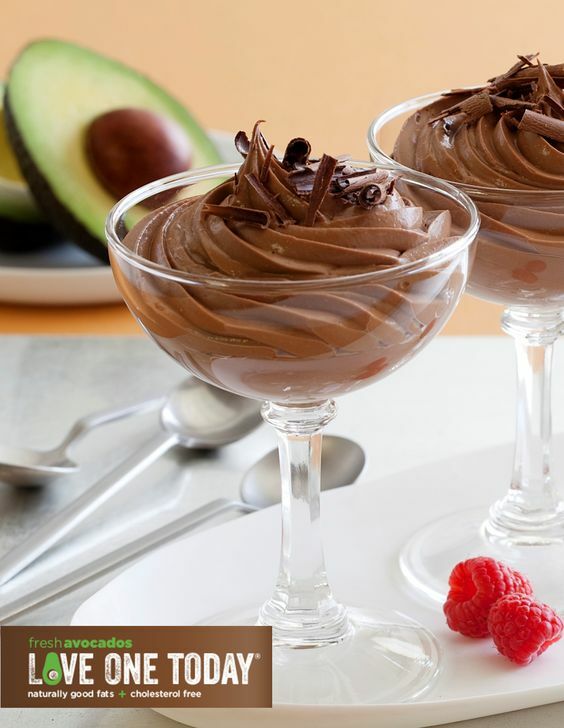 The good news is that this healthy avocado-chocolate mousse will not raise your blood sugar or cause that sugar crash of hypoglycemia, or encourage further food cravings. The perfect dessert! 1.Place the chocolate chips in a bowl. Place over a small saucepan of barely simmering water. Stir until the chocolate is melted and smooth, about 3 minutes. Set aside to cool. 2.Place the melted chocolate, avocado, cocoa powder, almond or coconut milk, sweetener, vanilla, and salt in a food processor. Blend until smooth and creamy, scraping the side of the bowl as needed. Spoon into glasses or place in a pastry bag fitted with a star tip and pipe into glasses. Refrigerate for at least 3 hours (Can be prepared 1 day in advance or even frozen and defrosted at room temperature). 1. Place the chocolate chips in a bowl. Place over a small saucepan of barely simmering water. Stir until the chocolate is melted and smooth, about 3 minutes. Set aside to cool. 2. 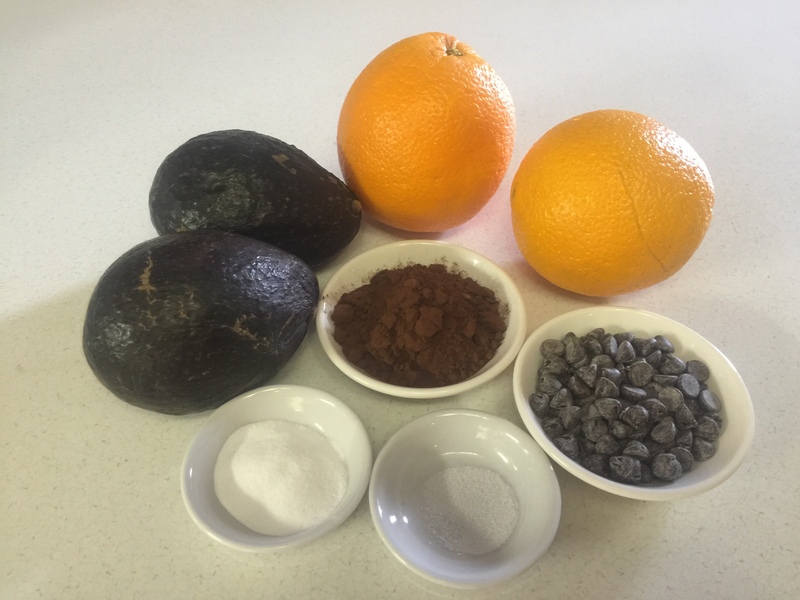 Place the melted chocolate, avocados, orange juice, grated orange rind, coca powder, sweetener, and salt in a food processor. Blend until smooth, scraping the side of the bowl as needed. Spoon into glasses or place in a pastry bag fitted with a star tip and pipe into glasses. Refrigerate for at least 3 hours. This is especially pretty if piped into a hollowed shell of half of an orange. I would suggest not to freeze this one. 2. Place the melted chocolate, avocado, cocoa powder, almond or coconut milk, sweetener, vanilla, cardamom, and salt in a food processor. Blend until smooth and creamy, scraping the side of the bowl as needed. Spoon into glasses or place in a pastry bag fitted with a star tip and pipe into glasses. Refrigerate for at least 3 hours (Can be prepared 1 day in advance or even frozen and defrosted at room temperature). I made all three of these mousse recipes and had a tasting with my friends. “Diva Eva’s Taste Testers!“ Although my preference was the cardamom version, the chocolate orange version got the most votes. 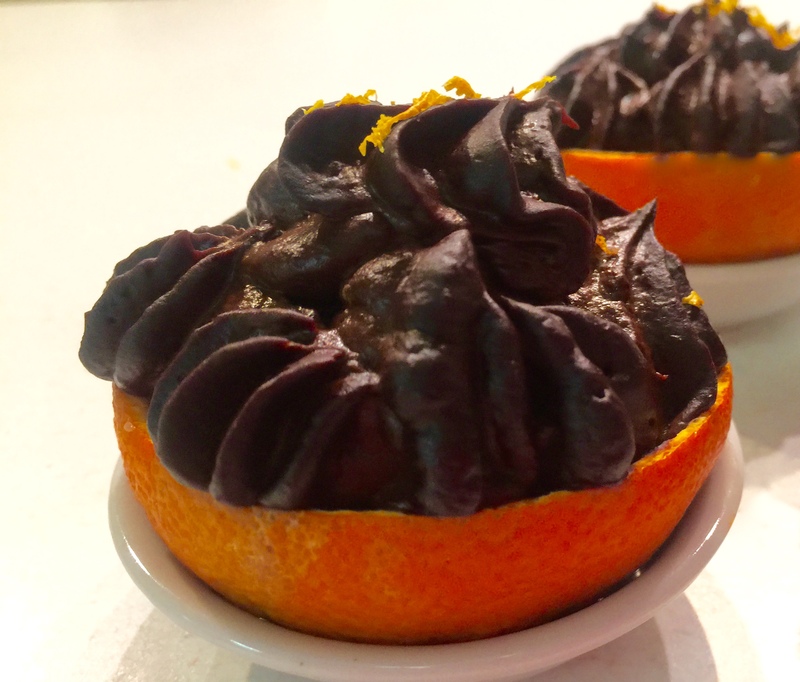 Orange is so good with chocolate! I will be serving it tonight with my visitors from the States! They will be surprised with the added avocado! Years ago, we used to serve the orange cups at Christmas dinners in Florida (the orange state) without the avocado. I am so happy that I have found a new way to serve avocados for my friends. They know I am a health nut! Talking about nuts, you can grate the avocado nut. Use it like salt and pepper. read more www.dailymail.com . 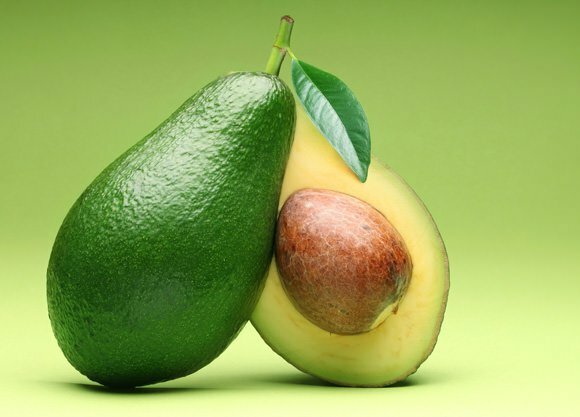 Add a half grated avocado seed to your smoothy. Did you know Queen Elizabeth uses avocado oil. FOOD TIP: Add toasted sliced almonds, mixed berries (frozen or fresh) and cocoa nibs. Top with yogurt + chia seeds or chia powder (grind some chia seed with a mortar and pestle and then sprinkle both chia seeds and powder on top of the dollop of plain yogurt). The sour yogurt will bring out the flavour of the sweet mousse. I have used lemon yogurt in a pinch! For peanut butter fans add a smidgen (to taste) in your mix. If you combine cardamom with orange works well too. Classic Chocolate Mousse is laden with heavy cream, eggs, egg whites and espresso coffee. However, you could add some instant coffee or espresso (to taste) to your A/C Mousse. Edible clover is good for St. Paddy’s day celebration! The clover would be lost on the dark, delicate dessert we just made. I would add a dollop of yogurt on the mousse. Then, sprinkle the edible clover in top of the yogurt for good colour. Here is another version. 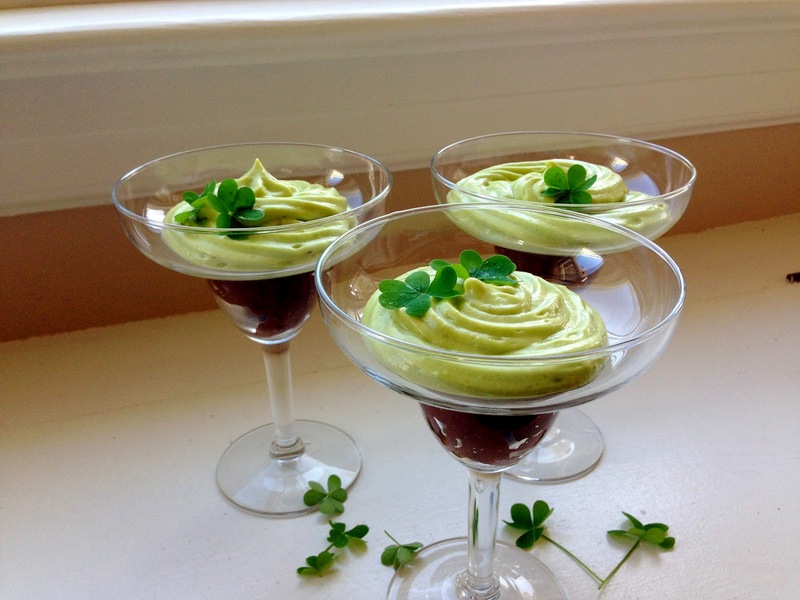 The St. Paddy’s Day Mousse from my friend at slendereats.blogspot.ca This recipe uses 6 egg whites giving a light fluffy texture to the avocado. Adding peppermint extract is a nice touch. The chocolate bottom has one tablespoon of instant coffee. It looks so pretty! Add Fresh Mint and Top with Edible Clover. Wonderful! They are yummy and healthy too! Can’t wait to try this. Your photos are very enticing! I had seen avocado chocolate mousse but you just convinced me to make them 🙂 Saving this recipe. I’m so glad! Adding grated orange peel, plain yogurt with edible flowers makes it more fun to eat. You can grow the edible flowers this spring. Place one flower in each serving. Your family and friends will be over joyed! A work of art! I am also an avocado fan. It’s nice since you can freeze the two versions. I hope you enjoy it! Thanks for visiting my blog. The avocado mousse looks really good. Not the first time I have seen avocado for dessert. When I was an undergraduate at Fresno State an Indonesian mom and daughters ran a hole in the wall restaurant. They made a wonderful summer dessert called ﻿Es Campur (Mixed Ice a la Indonesian) with avocado. Thanks to the Indonesian mama and daughters, this recipe looks very probable. I will look up your dessert! I’m always interested in something new! It’s the chocolate that’s the zinger for this recipe! Avocado is smooth and creamy. It blends well. Enjoy! Oh my, this looks so totally delicious I’m going to make some this afternoon. It is true “The eye does half the eating!” For chocolate lovers, you are also eating healthy. That’s what we try to do here at S.S.F. ~ tasty and healthy at the same time! I did make it that afternoon, the cardamom version, and it was over the top delicious! Next, I’m going to make the orange version. Wonderful! I’m glad you liked it! And it’s so healthy too! Terrific! Some people have made a combo of orange and cardamom together. My son likes the addition of a heaping tsp. of peanut butter! Wow this looks beautiful and delicious. Lovely! Thank you. I hope you enjoy it. And so healthy too! Try the cardamom mousse recipe! You have some great recipes. Glad I found your blog. Happy to share food ideas and recipes! Thank you for the invitation!!! Simply Splendid Food – Thank you so much, this will be just awesome. Please leave me a comment with the link to your recipe on the Sharing is Caring Recipe Exchange post and then I will have a track of your recipe and will schedule it for the next available opening. Thank you and glad that you are willing to come aboard with us on this project. I have added the link to your site, and Thx again for your compliment. You made my day! This Chocolate-Avocado Recipe is truly my most popular recipe….so far? What a great and super healthy dessert – I’m definitely going to try this! Thank you for sharing! What a clever idea! I love the photos and presentation of the dessert too! It’s good to see food with cheerful colours! Thank you! It always tastes better serving anything with an eye for art! Thanks again for participating. Remember. No limits, so feel free to send more.